John and Georgene Farmer (above) are here from Ashland, OR. 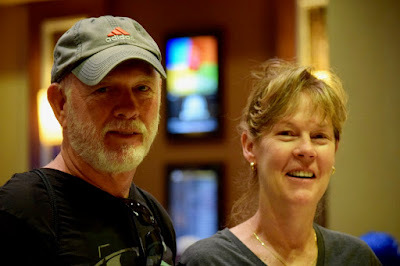 They came for last weekend's $100k GTD Catapult and are getting at least one more tournament in before they head back home from time in Las Vegas during the WSOP. 10 tables in action early in the $125 No Ante tourney. Looking around the tournament field I see a number of the usual suspects including Monte Gilley - who just wandered in - Shannon Kahahane, Candida Ross-Powers, Matt Boddorf, Mark Johnson, Tommy Carpenter, Sylvia Day, Rick Colson, Mike Postle and Brian Waller.